The American Pulses Association paid for my travel to a Pulses Immersion Event in Napa, CA but I was not compensated for this post in any way. 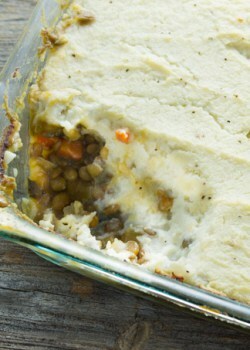 Just speaking from my lentil-loving heart! All opinions are my own. 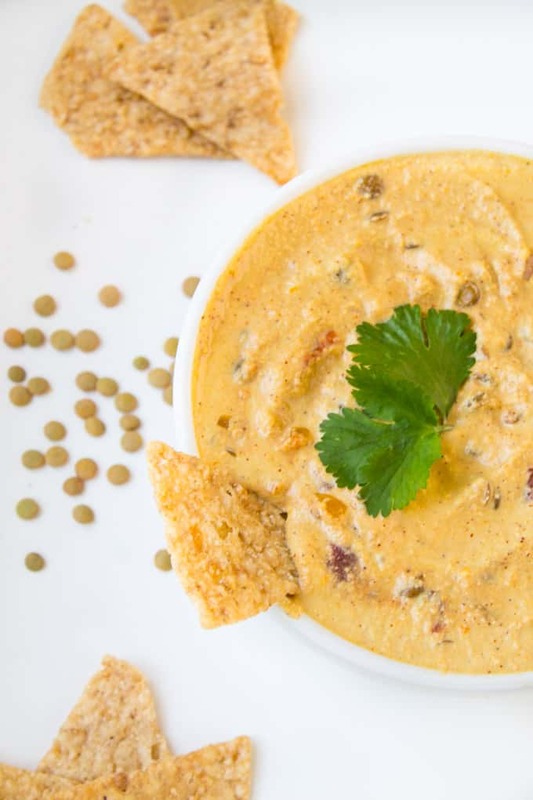 The perfect plant-based snack for Super Bowl Sunday – this Slow Cooker Vegan Chili Cheese Lentil Dip is full of spicy chili flavor and a delicious and satisfying meaty texture. I feel like I don’t need to bore you with my whole Super Bowl spiel again. You heard that last week with my Vegan Loaded Sweet Potato Nachos recipe. I will share with you a different story though, one called #RealLifeImAFoodBlogger. It goes something like this…test a vegan cashew cheese dip for the blog on a time crunch…looks and tastes like soup…debates for 60 seconds whether or not to try again…worries about the sun going down for shooting…stares at sink overflowing with dirty dishes…decides to go for it…in a hurry, drops the food processor blade covered in cashew cheese on the kitchen rug…cashew cheese everywhere…cleans up cashew cheese…pulls off second recipe attempt…no longer looks like soup…tastes great…shoots just as the sun is setting…and wipes sweat off of face. 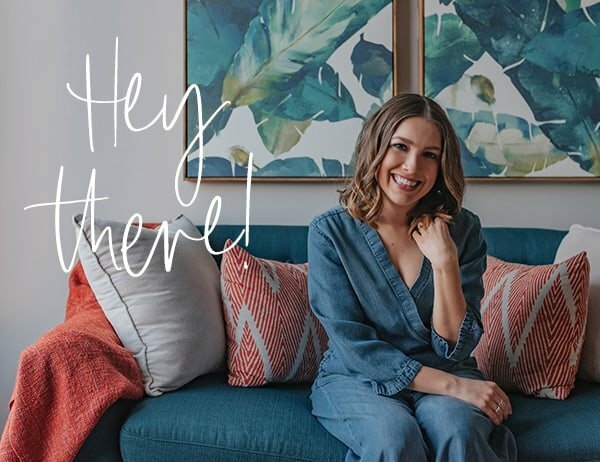 It’s funny I went out to dinner earlier this week with some clinical dietitian friends of mine who I know from my dietetic internship (which is the clinical training to become a RD) and they looked at me in awe when I spoke about what I do on a daily basis and said wow, that sounds amazing. And it IS. I wouldn’t deny that for a second. But it’s far from glamorous. Exhibit A above. But it is pretty cool what opportunities have come about from blogging. Like just two weekends ago, I was invited to join the American Pulse Association and the USDA Dry Pea and Lentil Council for a blogger/media pulses immersion at the Culinary Institute of America in Napa, CA to celebrate the International Year of Pulses! Yes, 2016 is the year of pulses! I’m not going to lie I had no idea what pulses even were until a year ago. In case you’re in the same boat, let me fill you in. Pulses include dry peas, lentils, chickpeas and beans and only the dry version. So, fresh peas are actually legumes, not pulses. Anywho the pulses event at the CIA totally inspired me to start doing more with pulses. I cook with pulses all the time but I never bake with them! And we spent hours in the CIA kitchen exploring with different baking and cooking applications. I can’t wait to start experimenting more with baked goods made with pulse flours and purees for the blog! 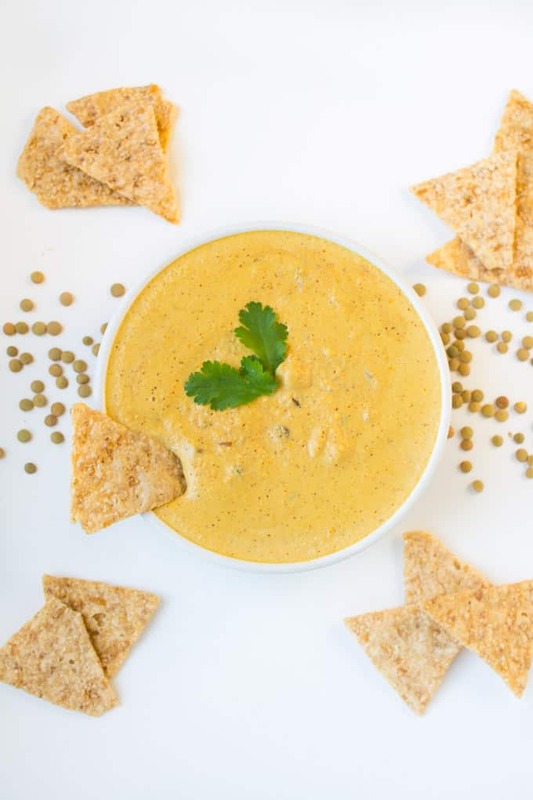 But for now, I make delicious vegan snacks with them like this slow cooker vegan chili cheese lentil dip. 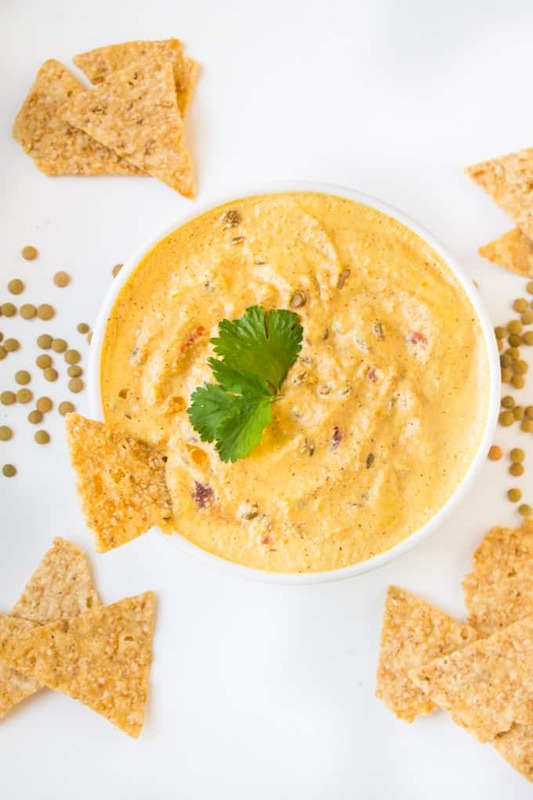 Throw ingredients for the lentil chili in the slow cooker, run Super Bowl errands, come back, throw your cashew cheese ingredients in the food processor and pour the cashew cheese into the slow cooker and you’re done! Easy. Peasy. Plus, the chili cheese flavor is so on point that you wouldn’t believe it was meat and dairy-free. Plus, the lentils add a savory, meaty texture that’s totally satisfying. Not to mention, added protein, fiber, vitamins and minerals. And then there’s the extra nutrition boost from the cashews, too. 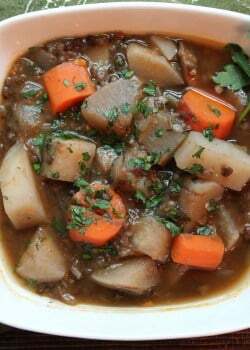 Add onion, tomatoes, lentils, chilis, 1 teaspoon chili powder, garlic powder, 1/4 teaspoon cumin, 1/4 teaspoon chipotle powder, 1/4 teaspoon salt, and vegetable stock to a slow cooker. Cook on high for 3-4 hours, or until most of the liquid is absorbed. 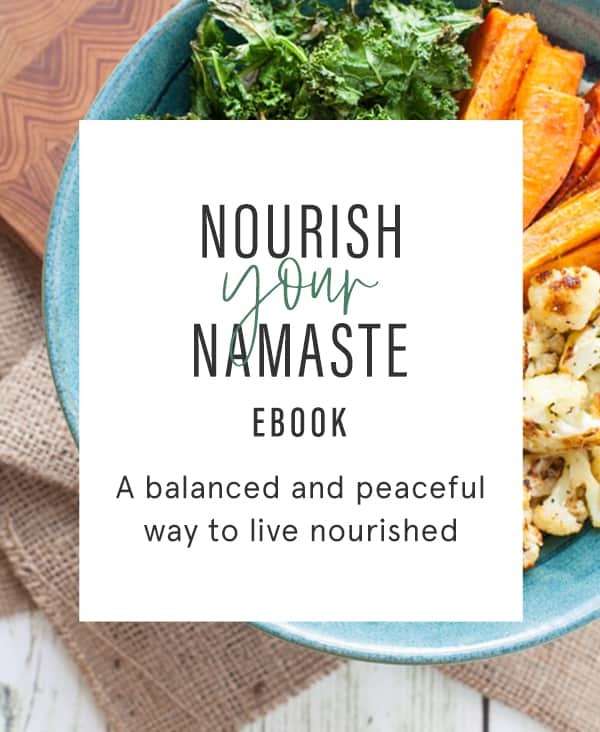 In a food processor, add cashews, bell pepper, nutritional yeast, 3/4 teaspoon chili powder, 1/2 teaspoon cumin, 1/4 teaspoon chipotle powder, 1/4 teaspoon salt, and almond milk and pulse for 3-5 minutes, or until smooth and creamy. Add extra salt to taste. 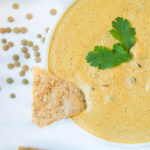 Pour cashew cheese into slow cooker and mix in with the lentils. Dip should be served warm, with tortilla chips and option to garnish with cilantro. Tell me, did you know what pulses were? Have you ever used them in the kitchen before? Ahahahahahah I can TOTALLY relate you your story. I’m dying with laughter over here. Looks great, glad it worked out! Yummy!!!! Thanks for sharing such a kind of recipe with us. It’s too tasty and easy recipe. Looking forward to making this, but it will only be for me so can I freeze this and if not how long will it last in the fridge? Thank you. I wouldn’t suggest freezing it as the consistency will likely be off when defrosted. It should keep for about 3-4 days in the fridge. Hope you enjoy, Louisa! This is so creative! I still have to get on this cashew cheese train. I’ve only heard good things! Wow, I’m definitely making this for my vegan friend! If I make it before I get to the store is it possible to leave out the nutritional yeast? Thanks, Janice! I wouldn’t leave out the nutritional yeast because it’s what imparts that cheesy taste. Let me know how you make out! Total touchdown. I’ve got a whole jar of nutritional yeast too! What a creative and beautiful recipe! I really want to try this!! 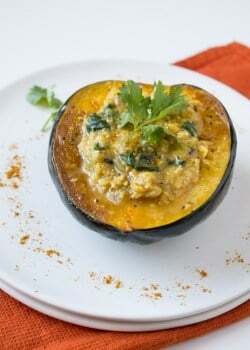 Yum, this looks absolutely delicious, especially for a nooch addict like myself. Love the use of lentils here too…can’t wait to try! Thanks, Steph! Hope you enjoy! I am so excited to try this recipe. A healthy version of something that usually is a sinful treat = pinch me! Thanks, Jennifer! Hope you enjoy it. Let me know how it turns out! Yummy! this looks awesome! So glad you decided to give it a second try. Sink full of dishes and no sunlight is always the most stressful/infuriating part of food blogging!! I need to use up my nutritional yeast, totes going to make this! Jen you can get nutritional yeast at most health food stores and online. I got mine at Sprouts last time. Thanks, Heather! 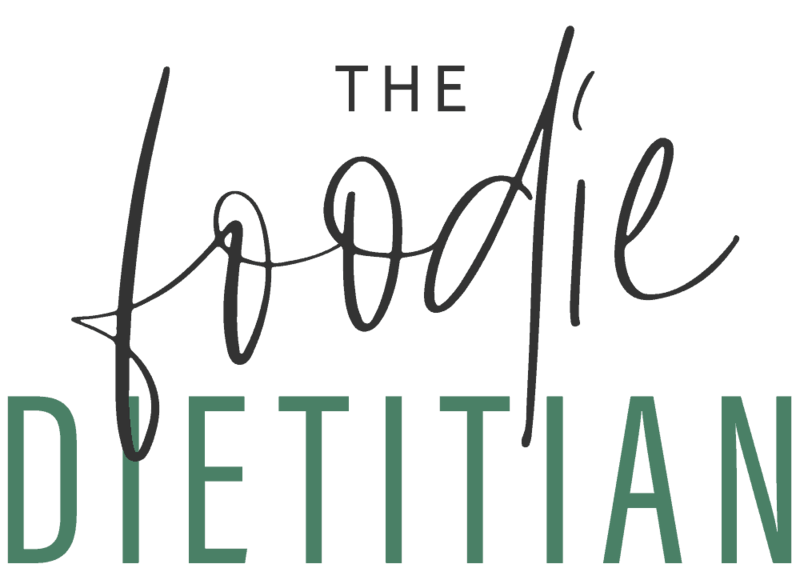 I’m glad you feel me on the real life I’m a food blogger front :). Hope you enjoy it! This looks SOOO good! I need to figure out where to get nutritional yeast from. Thanks, Jen! You can find nutritional yeast at Whole Foods, Walmart, Amazon or natural food stores. Good luck finding it!